Disney is one of the most visited travel destinations for families in the US. Unfortunately, Disney is not easy on the pocketbook. 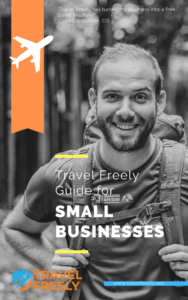 As a savvy traveler, you know that you can use points and miles to help reduce the cost of travel. Visiting Disney with points and miles isn’t the most intuitive option, and can quickly be overwhelming. Here, we want to provide you with a simple strategy for traveling to Disney with points. We will cover how to use points to get to Orlando, where to stay when you’re there, and how to use points for Disney tickets. For each, we will provide the best ways to travel if you’re under 5/24 or over 5/24. Not sure of your 5/24 status? 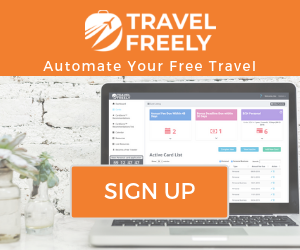 Check your Travel Freely dashboard to know where you stand before continuing. For this article, I’m going to assume a family of 4. If your family is bigger or smaller, adjust accordingly. 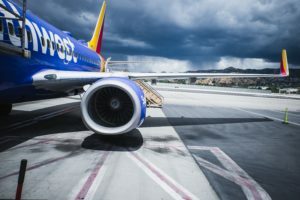 If you’re under 5/24, the best option for Disney is Southwest Airlines. You and your significant other can easily earn the Southwest Companion Pass and get 4 flights for the cost of 2. You get the 2-for-1 deal with the companion pass even if you’re paying with points. Keep your eye out for one of Southwest’s sales and you may be able to score flights to Orlando for as low as $49 one-way. 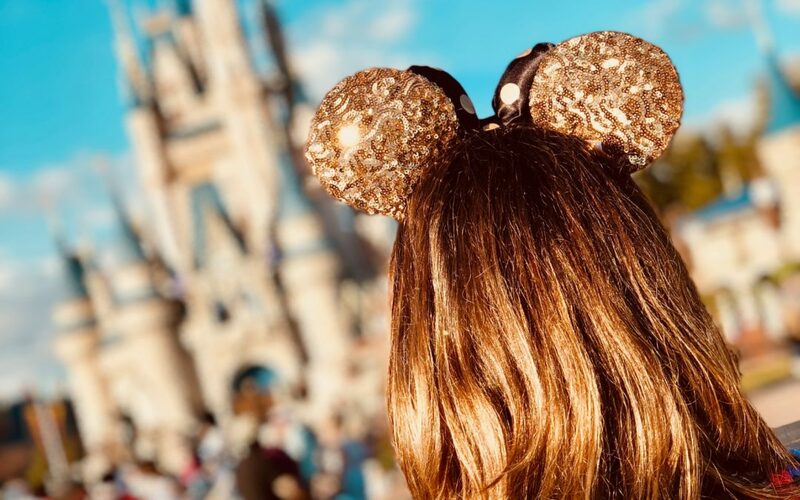 Since Southwest points are generally worth about 1.25 cents each, that means you’ll only need about 25,000 Rapid Rewards points for your family of 4 to fly to Disney with points during one of these sales. This is a great way to get to Disney with points. British Airways is a partner of American Airlines. You can use British Airways Avios to book an American Airlines flight for only 7,500 miles one-way. British Airways charges per flight, so you’ll want to find a non-stop flight to Orlando to secure this price. If you can find a non-stop flight to Orlando from your airport, a family of 4 will only need 60,000 Avios to fly round-trip. You can earn 60,000 Avios by transferring American Express Membership Rewards to the Avios program. You can easily get 60,000 Membership Rewards from the sign up bonus from the American Express Platinum Card or the American Express Premier Rewards Gold Card, which typically has a bonus of 50,000 points. With a bit more spending on the Gold Card, you’ll have the needed points in no time. If you’re under 5/24 you’ll want to look no further than Hyatt hotels and resorts. You can sign up for the Chase Sapphire Preferred Credit Card, one of our favorite cards, which currently has an increased sign up bonus of 60,000 points after meeting minimum spend requirements. Hyatt has two properties near Disney to stay at, and both cost 12,000 points per night. The Hyatt Regency Grand Cypress Resort is near Disney Springs, and all other Disney parks are less than 10 miles away. With the 60,000 points from the Chase Sapphire Preferred you can get 5 free nights at this resort. To make the Hyatt Regency an even better value, you can redeem an extra 5,000 points per night for club level access. This will get you free breakfast at the regency club and nightly hors d’oeuvres. Some Hyatt Regency Clubs have such a generous hors d’oeuvres spread that it can easily substitute dinner. With breakfast and dinner covered your family can save hundreds of dollars per night when you travel to Disney with Points. 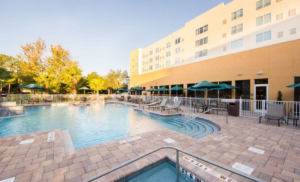 Another option is the Hyatt Place Orlando/Lake Buena Vista which also costs 12,000 points per night. Rooms at Hyatt Place are very spacious, with beds plus a living room with a sleeper-sofa. You can easily fit a family of four in one room comfortably. When you book directly through Hyatt with points you’ll receive free breakfast. You won’t need to spend any additional points like you would at the Hyatt Regency. The Hyatt Place is well-located as well. You’ll be 3 miles away from Walt Disney World Resort, which will save you a lot on transportation to and from the resort. Unfortunately, only Chase Ultimate Rewards transfer to the World of Hyatt award program, and the World of Hyatt credit card is issued by Chase and also subject to the Chase 5/24 rule. If you’re above 5/24 you’ll want to look towards other options. 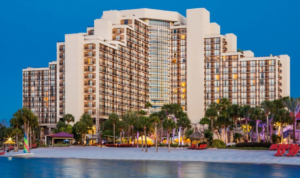 Hilton Honors is another option for your trip to Disney with points. Hilton has a 5th night free benefit, which will help stretch your points farther. Hilton also has a dynamic award chart, so prices may vary. However, the points costs here seemed pretty typical, any difference tended to require less points rather than more. You’ll be looking at the Hilton Doubletree or the Hilton Orlando Bonnet Creek. 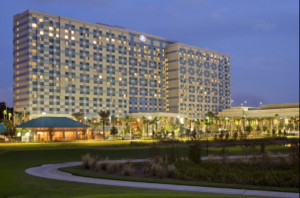 The Hilton Bonnet Creek is on Disney property, and offers some extra Disney benefits such as magical hours which makes it a better option for Disney with points. However, availability is a bit harder to come by, so the Doubletree is a good backup. Both will require 50,000 points per night, for a total of 200,000 points for 5 nights. You can open the Hilton Honors and Hilton Honors Ascend card, both by American Express, and have enough points for 5 nights. Whether you’re under or over 5/24 won’t matter for getting tickets to Disney with points. Your best bet will be using either Capital One Venture miles or Barclays Arrival+ points. You can use Venture or Arrival+ points to erase travel charges made on your credit card. In order to erase the charges, you must avoid booking through Disney directly. Instead, book with Undercover Tourist. Booking directly with Disney doesn’t code as travel , so you wouldn’t be able to erase the tickets with your points. Undercover Tourist is a well-known travel agency for Disney Tickets, and purchases from Undercover Tourist code as travel on your credit card statement. You can also purchase your tickets from Expedia or Orbitz using your Arrival+ or Capital One Venture card. After it posts, you’ll be able to erase the charges. Tickets to Disney can be expensive, up to $100 per day. However, the more days you purchase the cheaper they become. If you and a spouse each get an Arrival+ and Capital One Venture card you can easily have about $2,000 to cover your tickets. If you’re under 5/24, your best bet for traveling to Disney with points is to earn the Southwest Companion Pass. For a family of four with two companion passes, you’ll need about 25,000 points for round-trip flights for your entire family. You can stay at either of the Hyatt properties for 12,000 points per night. With the sign-up bonus from the Chase Sapphire Preferred, you’ll have enough points for 5 nights. Finally, with Barclays Arrival+ Points or Capital One Venture miles you can erase your ticket costs purchased from Undercover Tourist or other well-known online travel agencies such as Expedia or Orbitz. For those over 5/24, you’ll need a few more points for your flights. You’ll be looking to transfer American Express Membership Rewards to British Airways Avios. If non-stop flights are available from your airport to Orlando you’ll only need 60,000 points for a family of 4.